I have no idea what happened to Rabbit's eye. Poor thing must have gotten too close to Pooh's honey jar and gotten a paw to the face. And see these? Aren't they cute? 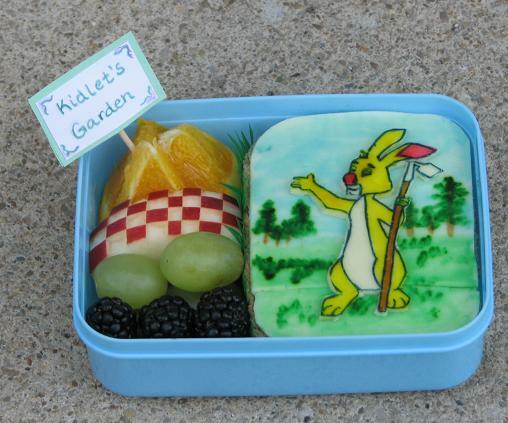 Wouldn't they look great labeling the little garden rows in a garden theme bento? Yeah I thought so too. Until I tried to put them in the bento and found them to be HUGE. *headdesk* They look very lovely on my kitchen table....sadly missing their chance at bento fun. I love it!!! It's so super cute and those picks!!! It's a shame that they all couldn't fit into the bento box. I am unlucky at contests too...but they are sure fun to enter! 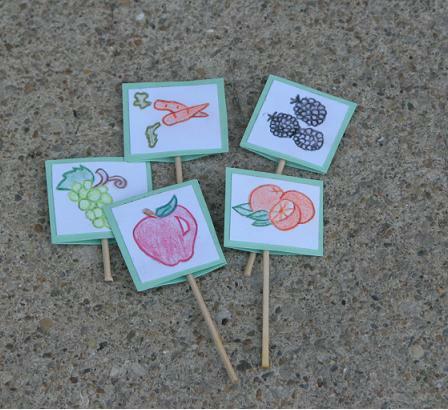 Cute garden picks...maybe you could use them in a family/picnic sized bento? Rabbit looks good, even with his eye! Oh gosh, those little garden signs are so adorable!! I'm very impressed with your artistry, Jenn. I think Rabbit looks great! Those signs are very cute! Tiny versions of that would be adorable too! The bento is adorable! Maybe the picks could be used in a picnic bento instead.